Flippin' Utah Mormons: Christ as "humanist"? I stumbled across an interesting graphic on Facebook. Based on this graphic, I think Jesus was a humanist. These are, at their core, among the basic tenets of His teachings. Any "reward" He may have spoken of was not to be expected in one's mortal life and He wasn't one to try and scare people into obedience. He's aware of everyone's capacity to know what is right and to use their free will to act on it. It's unfortunate that these key Christian principles are not often associated with modern Christianity. To see them repackaged with a "Humanist" label in an apparent attempt to remove any general religious—or specifically Christian—authorship is more than a little disappointing but certainly not surprising. 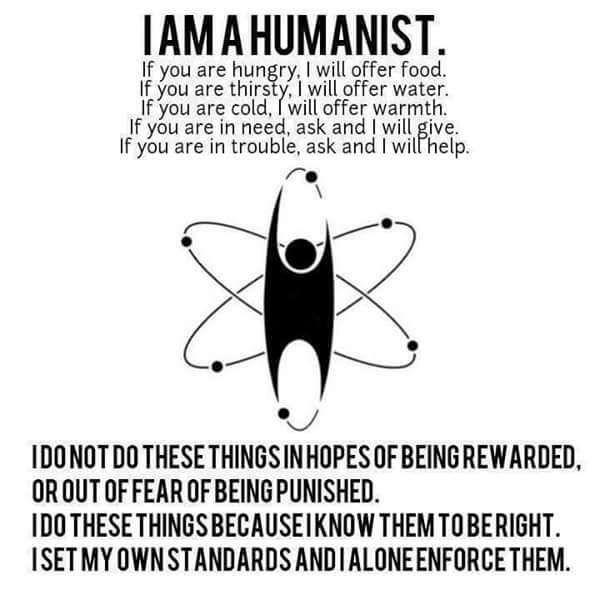 I don't place blame for this disconnection of spiritual principles from their spiritual source on anyone who chooses to call themselves a "humanist." Rather, I feel that the responsibility falls on those who call themselves "Christian" but fail at even attempting to follow Christ’s example. When "Christians" exhibit selfishness, indifference, intolerance, a general lack of empathy for their fellow (hu)man and an unwillingness to offer assistance of any kind to the less fortunate—often extolling the "virtue" of self-reliance despite living in a world where many are systemically disadvantaged—is it any wonder that over time these gross flaws in character become not only associated with "Christianity" but definitive traits? Thus leaving Christ’s most consummate teachings to be adopted—even plagiarized—by others and offered to the world as an “alternative” to the religion that bears his name.